Planet Fitness CEO Chris Rondeau chats with FOXBusiness.com’s Jade Scipioni about the company’s debut on the New York Stock Exchange. 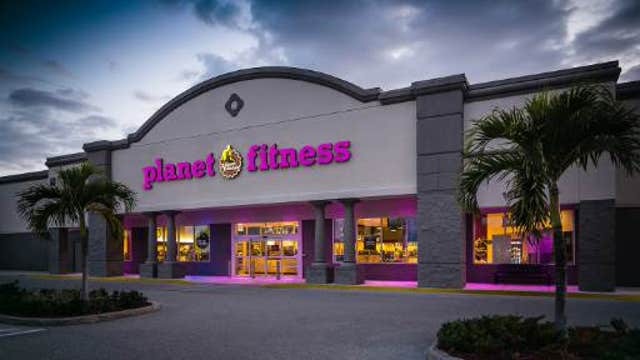 Planet Fitness (NYSE:PLNT), the budget fitness chain, fell flat during a disappointing trading debut. The $10 dollar a month gym shares were priced at the top end of the expected range of $14-$16, hit a low of $13.75 before recovering to trade at the IPO price of $16. “While it opened at a discount to the initial deal price of $16, the amazing price discovery system still in place on the floor of the NYSE for over 100 years found the right level to open the stock at $14.50, a price where public buyers saw value and wanted to get involved,” says NYSE trader Peter Tuchman. Planet Fitness raised $216 million by selling 13.5 million shares, excluding the overallotment option, which gives underwriters the opportunity to sell additional shares in certain circumstances. "We actually have a humorous alarm on the walls of our health clubs that if someone judges, drops weights or grunts, we hit the alarm to kind of keep the atmosphere a little calm." “In a very volatile down session this IPO has performed well after its potentially disappointing open, having steadily risen in a very negative tape to a high of $16.17 and settling in for a fine overall performance,” adds Tuchman. The company’s CEO, Chris Rondeau told FOXBusiness.com that they have big expansion plans in the works. “We have 1,000 more units committed with our current franchises --with half of them opening in the next three years. So, that’s what we’re focused on,” says Rondeau. “I came on with store number one, we only started franchising in 2003, and today we have over 1,000 locations and 7 million members. Rondeau says he’s not worried about the other discount gym competition like Blink or Anytime Fitness. The “gym” chain who doesn’t like to be referred to as one says they like to operate in a “Judgement Free Zone,” where workout junkies aren’t welcomed. “We actually have a humorous alarm on the walls of our health clubs that if someone judges, drops weights or grunts, we hit the alarm to kind of keep the atmosphere a little calm,” adds Rondeau.